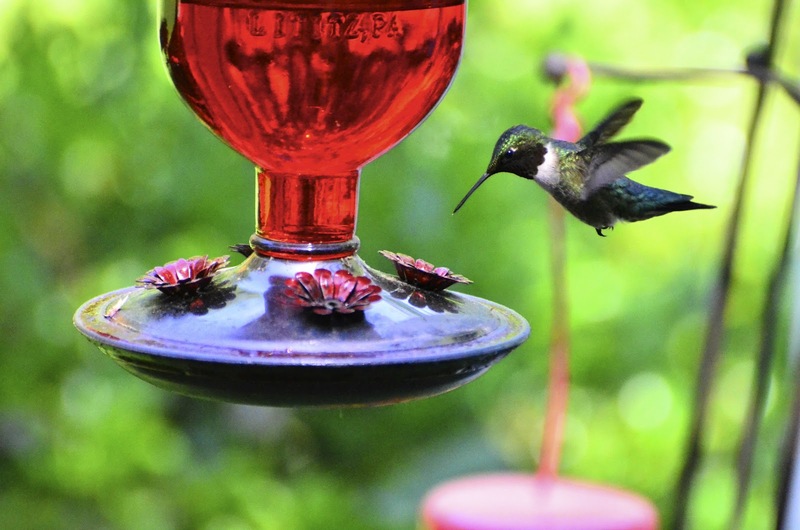 several ruby-throated hummingbirds visit frequently. And thrilled again that they have returned. So overwhelmed that my photos are so-so. I'm hoping of many more opportunities! I'm guessing this is his mate. but are a bit skittish when I move in my office window reaching for my camera. Hope they get over that. Last year, my visitors never seemed to mind my movement. They got so used to it, that we eventually got to feed them from our hand. You may remember that post last year. Here's a pic of that sweetness feeding from my daughter's hand. I'm hoping for repeats again this summer! but rarely did the males. So far, this black-chinned hummingbird is visiting often. By the way, do you ever wonder how in the world they find our feeders?? Guess that's a question for Google! They're here, too. I could sit and watch them for hours! cool! we only get ruby-throats here so i'd be thrilled to see a black-chinned. you are astonishing, really astonishing, you really took my breath away. I am in love with your magic blog. These are terrific, Reena! And how beautiful they are! 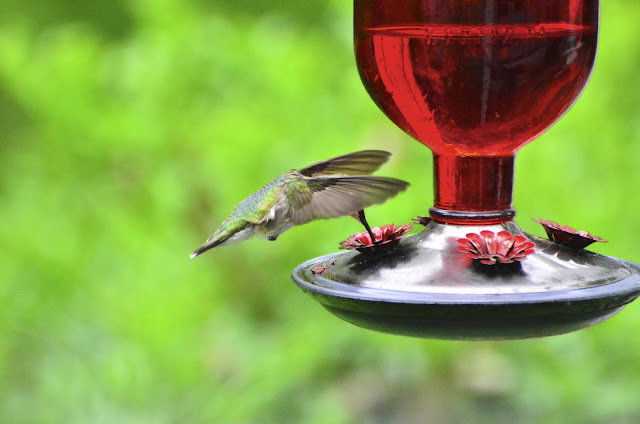 I do love hummingbirds, but you don't see any in the area where I live, so I enjoy your captures even more! Hope your week is going well! Thanks for sharing the beauty!! I love hummingbirds. Wow, I would never have believed one would drink for the hand. Cool shots. I saw one a couple of weeks ago at our feeder (but it had no food) so I immediately went and filled it, but none have returned. Love those little guys and these are magnificent! What a wonderful, rare experience to see one of those black chinned beauties!!! Keep trying to get a photo with the light showing the brilliant purple throat. 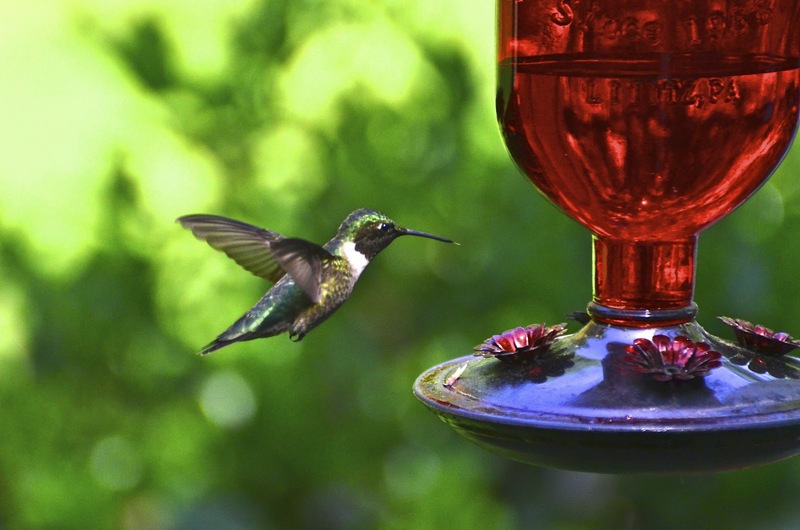 I seldom see hummers at my house during the summer. Only occasionally during spring migration, but more so during the fall migration. I had no idea a hummingbird would drink from your hand. That is the coolest thing I have seen in a while. What an experience to have that happen right in front of you. amazing birds and great example of exercising the food intake away. 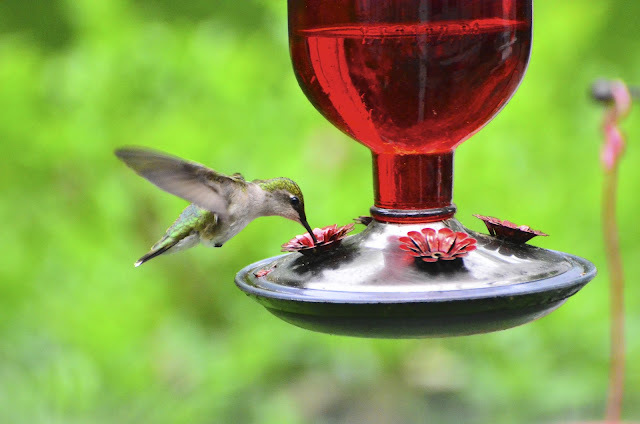 We had a heavy spring rainstorm move in last night right before dark...and the hummingbirds were fighting over the feeder outside my family room window. That's typical behavior in the rain. ;-) Generally, the males won't share, but last night, two males and a female were perched on the feeder at the same time. Only when another male tried to share did the musical chairs begin. ;-) I, too, have a black-chinned hummer ...and he's staying around longer this year. Calliope, rufous, and Allen's are the other varieties. I would LOVE to try feeding one from my hand! I haven't seen any here yet, can't wait. It was funny that last year the females were more visible than the males. Beautiful pics. Gorgeous. That photo of the hummingbird feeding out of your daughter's hand is amazing. Are you kidding me? The bird feeding from a hand? Unbelievable. Amazing amazing photography. Oh, Reena. I love these. I didn't see your post last year with hand-feeding, although I've heard they will do that! You have captured living jewels!!! And I have never seen a Black Chinned one, I think they are more rare than the Ruby Throated. They are beautiful. So far, we've only had some passing through. HI Reena...Aren't they wonderful feisty little fella's, I don't know why ,but if I don't have the feeder hung by the first weekend in May...get this..they come right to where I hang it and make a buzzing noise and zoom back and forth..I don't know how they find them!!! Your photo's are so cute..love the wings over his head one!! How amazing to have them feed from the hand ..hope you get a picture this year to!! Yes they are back... and so very thirty. They are one of the bird I miss. I don't put bird feeders out any longer, I guess I should start again. That does it...Tomorrow I'm putting my feeder back up because your stunning pictures have given me the nudge to do it--THANKS for that!! Wonderful shots! Ours are back too, but I've only have seen the ruby-throated hummers. Special captures of a truly special bird! I've never seen anyone ever hand feed a hummer before. That's awesome! PBS had a Nature show on hummers last night that I wanted to watch but our power went out after about 10 minutes into it. Blah! at first I thought 'oh she's so excited we're visiting this weekend, she's posting about it' .. HA! I hope to catch a few snaps of those adorable little creatures myself. Fantastic shots! They are very quick! I can remember getting many blurry shots! I can remember reading somewhere that they return to the same places year after year so if you want them back make sure your feeders are ready the following year. Looks like you have done a great job of that! Enjoy! Your feeder is a fantastic stage. The birds dance and perform, that attracts so much. Don't they look for something bright colored? You don't need red food, just something red on the feeder to attract them is my understanding. We have a few males and it is so fun to watch them engage in air battles! They can be real dive-bombers! OMG, these are so awesome!! I'm a little jealous as I have a feeder right next to my lantana and have only had one visitor. I think I'm going to try to make my own sugar water from scratch. Maybe they don't like my store-bought stuff. Anyway, the photo feeding out of the hand is incredible. Oh my gosh...that hand feeding picture nearly made Mom jumped out of her chair. How long did your daughter have to stand like that? Mom is also a huge hummer lover. Thank you for these love pictures. My hummingbirds don't share well eighter. This is the first year (We've lived here 3 now) that I have seen the ruby throated ones. Love the picture of the little one on your daughter's hand. I never thought they would do that. Now I want to try it. Had a chuckle at your query about how they find our feeders... apparently (according to my hubby) they are very inquisitive birds. We're still awaiting our first sighting this Spring... hope it's soon! The photos are amazing. How cool you are able to feed them from you hands. 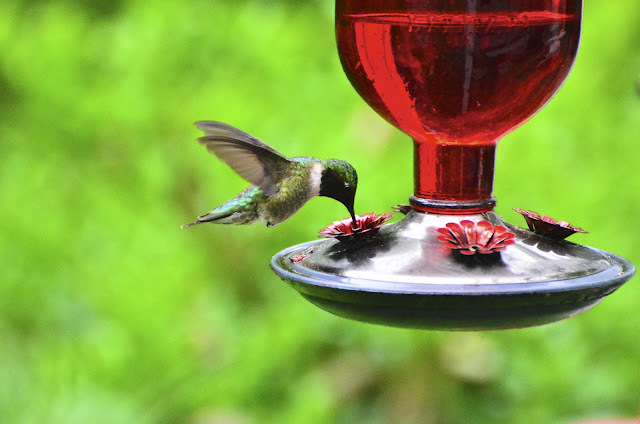 I only see the Ruby Throated here, so I am envious of your Black Chinned. Lovely post on your hummers. 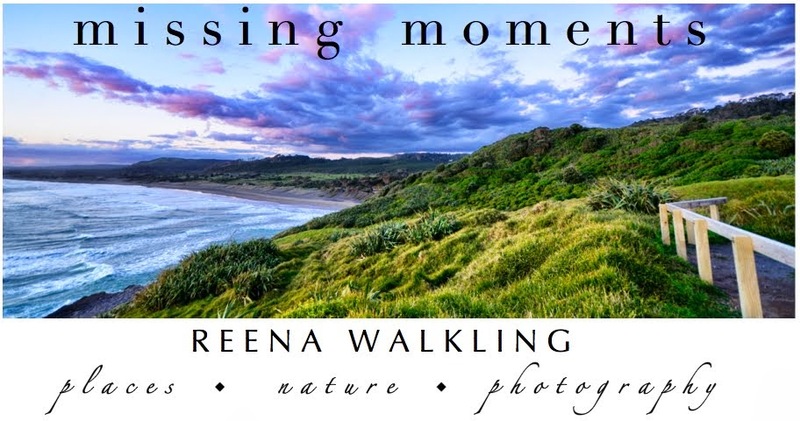 Reena, your photos are far from being so- so, they are AMAZING! Saying your photos are so-so is like calling Mout Everest a hill! Oh my gosh.. These are such great photos.. Yes, I am smiling at my computer while looking at them..
Wow! 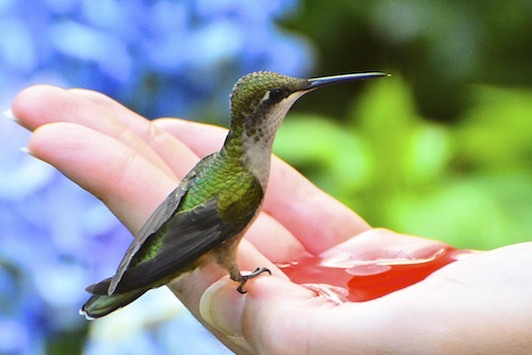 I had no idea that a hummingbird would ever eat from someone's hand. Way cool! Reena, these are amazing photographs, and I never thought one would land on a person's hand!! As far as I know, they look for anything red, which is probably how they find the feeders. however they do it, I'm sure glad they do! So beautiful this photos, so amazing this moments! !